SANTA MONICA, Calif. – In a judgment handed down on June 12, the U.S. Court of Appeals for the D.C. Circuit rejected a challenge to an historic Consent Decree that allowed Santa Monica to shorten the runway at Santa Monica Airport (reducing jet traffic by over 80%) and gave the City the absolute right to close the airport at the end of 2028. On Friday March 23rd, Angel Flight West, a Santa Monica-based charitable aviation organization, will mark its 75,000th flight. His passenger will be 19-year-old Juan E. Juan has an unpronounceable genetic disorder, familial hypercholesterolemia, which can lead to premature heart attacks or strokes. Once a month, the teenager sees a cardiology specialist at Cedars-Sinai Medical Center in Los Angeles, with transportation provided by Angel Flight West (AFW) -- for free. New and revised earthquake fault zones mapped by the California Geological Survey—including a newly identified Santa Monica fault boundary—reinforce aviation advocates’ assertion that Santa Monica’s embattled airport could play a lifesaving role in disaster-relief operations if a major earthquake struck the area. The Ninety-Nines is the international organization of women pilots that promotes advancement of aviation through education, scholarships, and mutual support while honoring our unique history and sharing our passion for flight. The Long Beach Ninety-Nines is a local chapter and they have decided to host a Summer Social event at Santa Monica Airport. Hangar 24 Craft Brewery will donate proceeds of its Wheels Up Helles Lager to Angel Flight West, which organizes flights for people who need to travel long distances to access medical care, as well as flights for kids and teens to attend specialty camps, and for individuals escaping domestic violence. Opponents of Santa Monica airport, including all seven members of the Santa Monica City Council and a tiny minority of Santa Monica households, .0001%, from August 2015 airport reports, are working to close the airport, they claim, on the grounds of noise, safety and pollution. However, more traffic, more congestion, and more development will inevitably follow if the Santa Monica Airport is closed. JetSuiteX donates up to $25,000 in flights to Angel Flight West to transport underserved patients to medical treatment. Breakthrough air travel company commemorates its first year in operation by supporting air travel and ground transportation with endeavor award auction donation. The Jr. 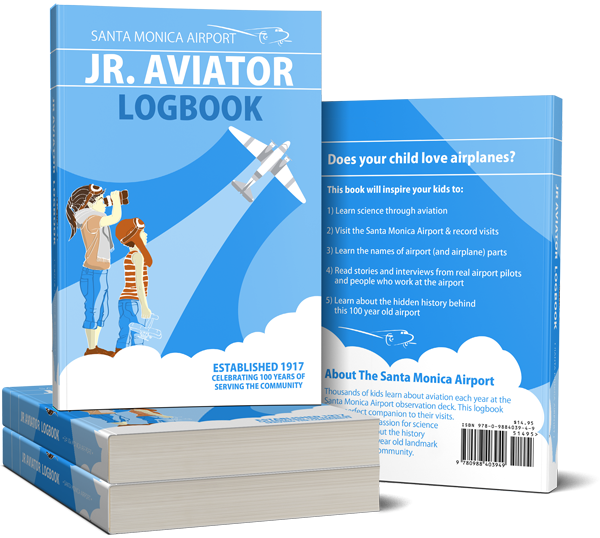 Aviator Logbook will inspire your kids to: Have fun learning science through aviation, visit Santa Monica Airport & record your visits, learn the parts of an airplane and all about the airport, read stories and interviews from real pilots and people who work at the airport, learn the fascinating hidden history of this landmark 100 year old airport. We wrote this blog up to bring you some of the latest news updates from November and December 2016. The Federal Aviation Administration on Tuesday ordered Santa Monica to halt the evictions of two aviation companies at its municipal airport until the agency can finish an investigation into the city’s effort to shut down the facility. Our events have inspired 3,000+ kids in Mar Vista, Venice, Culver City, Los Angeles, Santa Monica and the surrounding neighborhoods. Our airport creates 1,500 jobs and brings $245MM in business to the local community. Learn more about our history and join our mailing list to help support us.